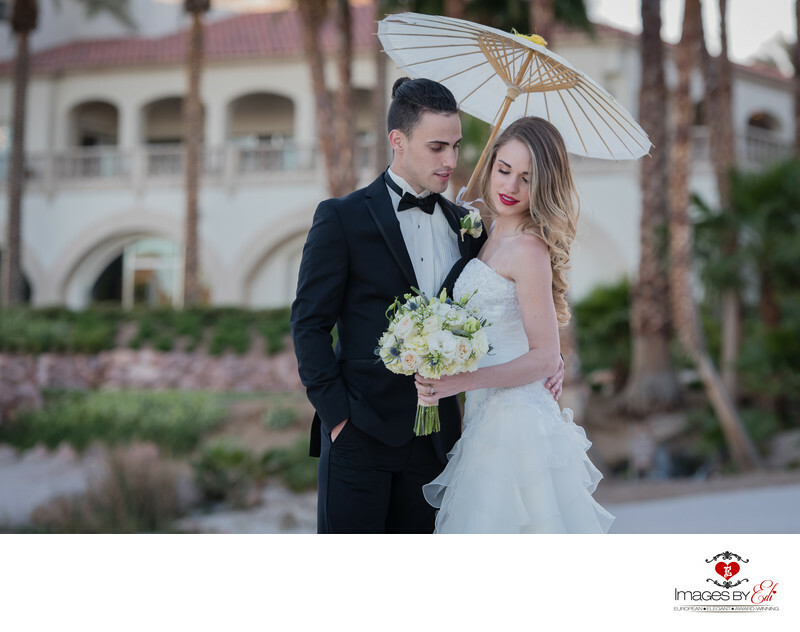 As a wedding photographer, love to photograph weddings at Lake Las Vegas. One of my favorite locations there is the Reflection Bay golf course. We did a styled photo shoot for the Reflection Bay golf course on their property and this image is one of my favorites from the session. Our bride and groom is an actual couple in love. I just love how the groom passionately looking at the bride and the clubhouse behind them. I am getting a lot of questions about the umbrella. Yes, it's mine, so if you would like couple of images to capture with it I can bring it along to your photo session or wedding. The flower decoration and the brides bouquet were made by the talented Natalie and her team at Petals Flowers and Events, Inc.
Keywords: Images by EDI (300), Las Vegas Wedding Photographer (624), Las Vegas Wedding Photography (642), Reflection Bay Golf Club Lake Las Vegas Wedding Photographer (6), Reflection Bay Golf Club Lake Las Vegas Wedding Photography (6), Wedding Couple (204).